Current New Zealand motocross champion, Cody Cooper, was expected to carry his blistering form into the 2013 Monster Energy MX Nationals. However, until round five at the picturesque Conondale circuit on the weekend, Coops’ campaign had been rather subdued as the quiet-spoken fella struggled with his own personal motivation and to find a suspension set-up he was happy with. Now it looks like everything has clicked. The Cody Cooper we had expected to see finally arrived at Conondale as he became the third winner in the five rounds we’ve had so far. www.MotoOnline.com.au caught up with him after his breakthrough Conondale victory to find out what’s changed. 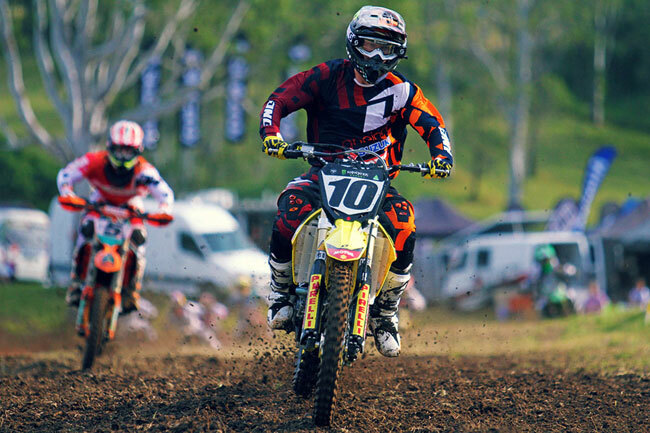 Cody Cooper took his first MX1 overall win of the season at Conondale. Image: Simon Makker/Makkreative.com. Coops, congrats on finally getting your first win of the 2013 series. This was your first Super Pole win as well. How does it feel to finally be on the receiving end of those five points? It feels great, especially when it helped me win the overall for the day. I didn’t gain any Super Pole points at the first three rounds and it was frustrating because I felt like I rode well in those first qualifying sessions. This is a lot better for sure. Again those points have played a big factor in the outcome for the day; without them you would’ve finished the day in second place. Yeah, Mossy [Matt Moss] and Billy [Mackenzie] both got Super Pole points too, so we’re all there, but there wasn’t much between us in the points otherwise. I think Moss would have won the overall if there were no Super Pole points and Todd [Waters] would’ve probably been second as he went hard in that first race. You seemed to have way better form today than what you’ve had over the past three rounds. What do you put that down to? I guess I like to be comfortable when I’m riding and until today I haven’t been that comfortable on the bike. We’ve been working hard trying to find the right settings for the fork and I was a bit confused there. We were going back and forward with different suspension settings trying to find one that I was comfortable with. I’m loving it now – we’ve got a good setting that we’ve gone back to. I had used it in testing but hadn’t raced with it. I should’ve used it at Broadford, really, but you learn from your mistakes. 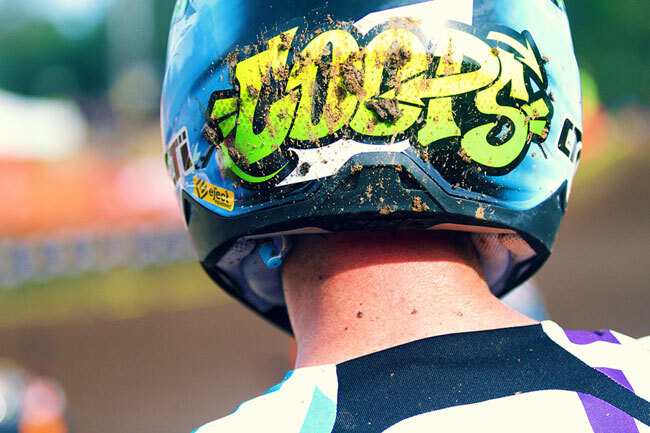 You came into the 2013 MX Nationals off the back of a great performance at the New Zealand Motocross Championships. There was a lot of expectation both from the public and probably from your team to carry that into Australia. Did that pressure affect you at all? I’m not sure. Maybe it did, but most of the problems I had were with myself. I wasn’t riding well and it’s no-one else’s fault. I know my starts are good and I know I’ll definitely get at least one holeshot at each round. The issue I’ve had was pushing from the start for the whole moto. I lost a bit of bike fitness when I got out of my routine. My mind wasn’t in the right place. Cooper is planning to stay home over the break and return to his regular routine. Image: Simon Makker/Makkreative.com. I think that was most obvious from the outside at the second motos at Murray Bridge and Wonthaggi. You seemed to get swallowed up by the pack as the races progressed. Yeah definitely. It was almost a case of ‘the worse you go, the more over it you get’. It’s hard to keep that motivation when you come from some great form earlier in the season to find you’re going backwards in the races. But that was what was so standout for you today: you dominated that second moto, where in the past it seems to have been a bit of a chink in your armour. Were you pleased with your performance today? I know I would’ve gone better in the first moto, but I threw my goggles off early on because they were covered in mud. That second moto I got the holeshot and pulled out a pretty good lead. I tightened up a bit towards the end and my heart-rate spiked when I saw Mossy closing in. I pushed myself to the end though – I was almost spewing at the end! What are your plans over this mid-season break? Are you heading overseas or are you keeping it real back home? I’m not sure yet but I’ll probably stay home and start working on getting into a solid routine again. We’ve done a lot of testing trying to find these settings and that, as well as my lack of motivation, has affected my routine and I haven’t been able to do the long-moto training I used to do. I’m pretty keen to get back into it and come into the second half of the season on form. Sounds like a good plan, bro. Enjoy the champagne. Post race interviews with several riders, including Cody, are HERE. Race highlights are HERE.